We want you to grow with us, to develop new skills and gain valuable experience. This will help you in your current position and provide a platform for progression in your career. Training begins with our excellent Assessed and Supported Year in Employment (ASYE) programme – making sure your social work career gets the best possible start – and goes all the way to our Aspiring Managers programme, which helps experienced individuals take their next steps in management. We offer a comprehensive programme of one day courses, short courses and more formal accredited training programmes. Courses included safeguarding, child protection, working with resistant and evasive families, and more. We are also supportive of those who would like to move between disciplines and provide training to make sure their transition is as smooth as possible. This programme provides a bridge from qualifying training to practice. It is based on building a firm foundation of skills and knowledge that can be used as the basis of continual professional development (CPD). We work with many local universities including the University of Essex, Anglia Ruskin as well as the University of East Anglia (UEA). We work with you as professional Social Workers to explore your career pathway and help you in identifying needs and ways of meeting them. Experienced staff will be supported in their career choice to become a Practice Educator. We work with the University of East Anglia to place you on a specific training programme that will not only support you in supervising student social workers, but also in assessing our NQSWs. The programme will support you in supervising, mentoring, and assessing. 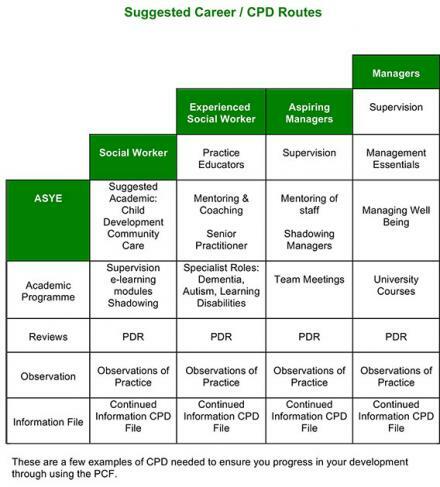 It provides a means of achieving the ‘advanced social worker' level of the Professional Capabilities Framework (PCF) – the professional social work educator pathway. Candidates will be able to evidence requirements of the Practice Educator Professional Standards (PEPS). If successful, you will be eligible to join our register of approved practice educators. Our aspiring manager framework is designed to support those who wish to take their career in the direction of team management.